Srzly, I spent most of yesterday trying to write code for a "grab my button" icon for 12 Finishes in 2014. The image part works fine, but the code box so 52 Quilts followers can paste the button on their own blogs did NOT! I tried three or four tutorials, but it was only when I started reading the comments on the tutes that I saw many people are having the same problem of an "empty" box on their "grab my button" widget! I promised "something nice" to anyone who would test it for me, and Irene did so. Of course, it didn't work. I think I'll send her a nice handful of my hair! All this to say, my good intentions of finishing off the last few BOM blocks and blogging about my ideas for 12 in 2014 UFOs -- didn't happen. I did, however, finish the first "Hats for Sailors" hat of 2014. I finished it last night while watching the first episode of Downton Abbey Season 4. The yarn is Millamia, 100% Merino washable wool. 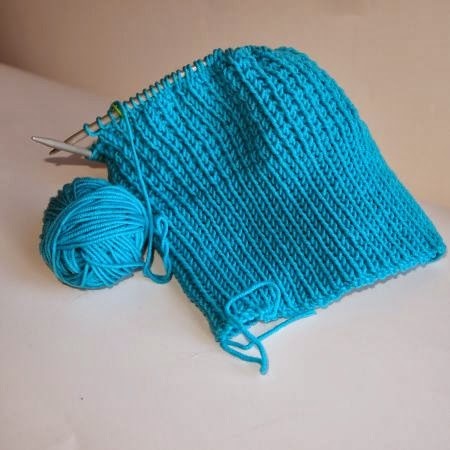 The Ravelry group Hats for Sailors is doing a knitalong of Graham this month It's a free pattern, so if you're a knitter, please consider joining us and knitting a hat for a US Sailor. This photo is from September. It's too dark to photograph in my sewing room right now, but I swear all except the 3D Sampler are up to date! I added some blocks to make the quilt larger. The quilt is blogged here. I love Bonnie and Camille's fabric! What project do you think I have in mind for this collection of Cascade 220 yarn? First correct guess gets the prize -- no, I don't know what it will be. Maybe a handful of my going-to-grey hair? Color work sweater is my guess! Martin, I'll make a hat or two. Let me know where to send them. 100% wool right? Washable preferred or can it be regular wool? Gina, you're correct -- Hats for Sailors must be 100% washable wool. Obviously, acrylic or other artificial fibers are a bad idea in a fire-danger locale! And I'll PM you the mailing address! And oh yeah -- it's NOT for a sweater! Sorry Marti! Spellcheck changed Marti to Martin in above comment! Hats for sailors? I don't know...the colors are oh-so-yummy! I think you bought a weaving loom and are planning on making pretty scarves. I'd guess hats and matching mittens. That's what I want to be making now that it's sub-zero where I am. The yarn is sure pretty and bright - right up my alley. ps. I certainly know your frustration with the blog stuff. I'm trying to get a few things changed for the new year and I can't figure it out either. But I'm patient and eventually it will get done. I think you're going to crochet a blanket with that colourful yarn. Maybe granny squares or a ripple? I did not mean to post this twice! And I've never heard of a temperature scarf, but I bet it's going to be lovely!! 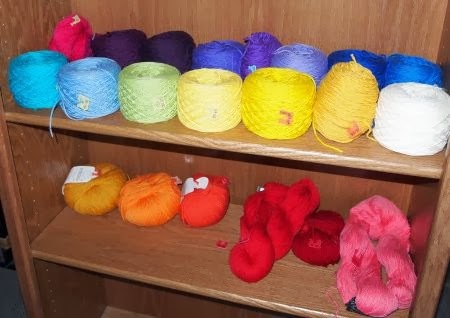 There's a lot of yarn there ... it could be so many things. 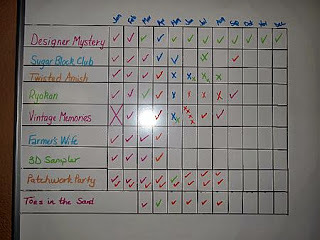 Has anyone guessed a rainbow-colored shawl yet? If you didn't sort out the button code, email me. I can help. The trick is using code that won't interpret the HTML code to share the button that you want to display. An afghan made of granny squares would be my guess. Don't mind me, I live in Glastonbury UK, where that kind of head wear is commonplace! I have a bright rainbow knitted jacket, which (along with tie-dye) is know as "Glastonbury camouflage"! Kudos to you for even attempting to write a code. I wouldn't even be that brave. I like your list and your check list. 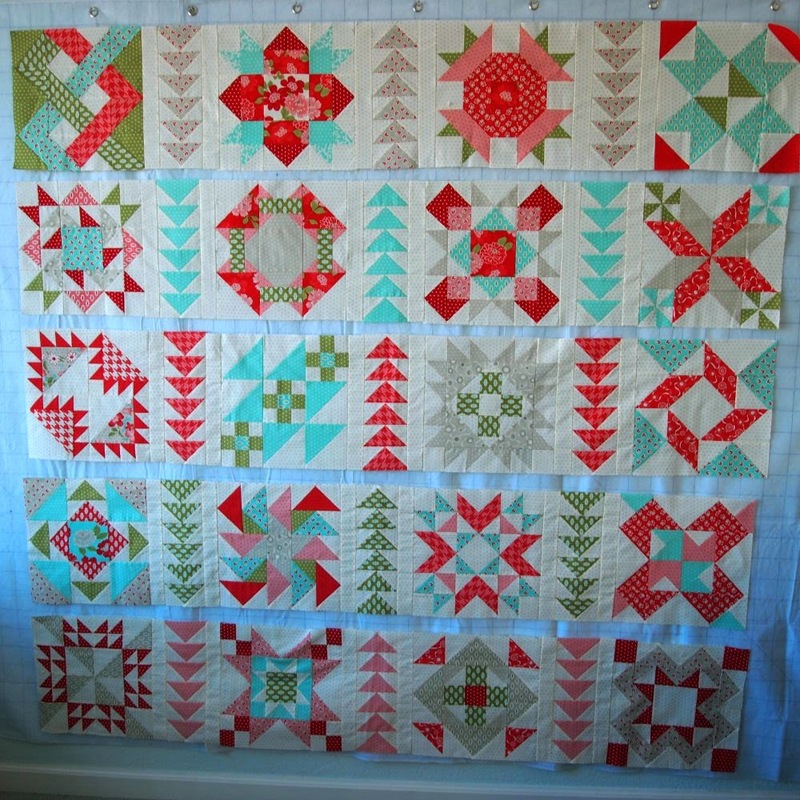 Your DM quilt is gorgeous... the flying geese really set off the blocks for a unique look. You are off to a good start on the year!